You know those little posters apartment complexes put up or hand out? Yeah, I should read those. I would have realized that today was their "resident appreciation" day. So this morning when I was leaving to go to work I was greeted by the three people who pretty much run the complex (its a small complex). They had a table all set out with drinks, food, napkins. 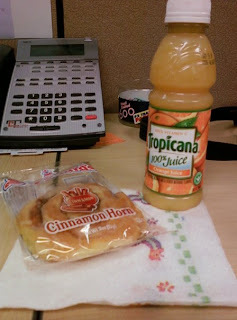 So I stopped, had a chat, and got to choose a drink and a pastry (complete with napkin) to take to work for breakfast. I <3 these people. Its awesome they even know my name.